Located in Plaza Central, this one bedroom apartment offers one of the best views of Las Catalinas! This apartment is tastefully decorated with white and blue colors which are the perfect match to enjoy the Panoramic Ocean Views. 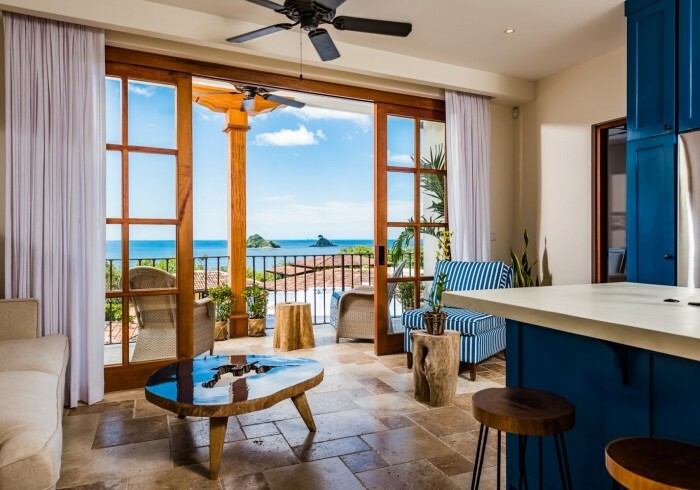 The fully equipped kitchen is comfortably organized for you to enjoy the ocean views at any time of the day. The Living Room has a sofa bed that can be arranged as a queen bed for any additional guests and a small dining table to enjoy your meals. The Master Bedroom with a King bed and large windows offers a great and open space to enjoy the ocean views. This bedroom has a private bathroom AC and fans as well as a small desk and a smart TV. Our Concierge Service can assist you to coordinating a variety of activities for your trip, including transportation from the airport, car rentals, spa treatments, and tours. We can even purchase groceries for you ahead of time! Safety is very important to us at Las Catalinas, and there is 24-hour security. We also offer daily maid service. For special occasions, ask about our Gourmet Chefs, who can prepare delicious meals in the comfort of your apartment. Our goal is to provide a stress-free environment so that, with everything else taken care of, you are free to relax, recharge, and explore!